Can you identify the baby in this photograph? A black and white negative of an unidentified baby wearing only a diaper and lying on a table covered in a blanket. In this view the baby is looking at the photographer. 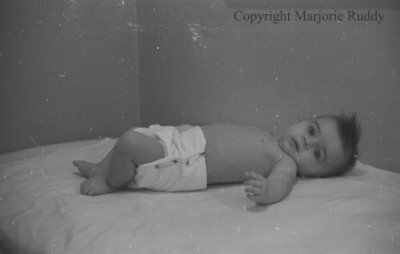 Unidentified Baby, c.1939, Marjorie Ruddy. Whitby Archives A2013_040_912D.